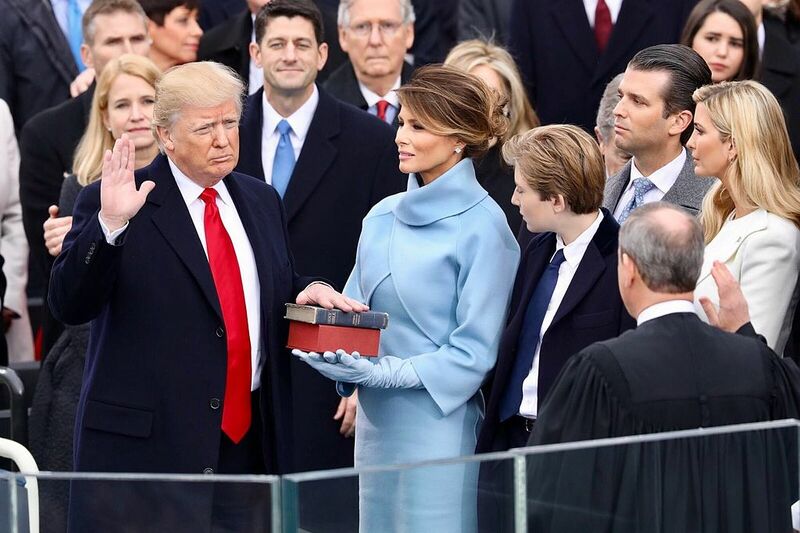 President Donald J. Trump is sworn into office on Jan 20, 2017 as his family looks on. Photo via Creative Commons. Impeachment of the president is done by the legislative body in Congress. However, many people confuse impeachment with removal from office; in actuality, it is just a formal statement of charges which can then lead to removal from office if Senate votes majority. In U.S. History, only three presidents have thus far found themselves facing impeachment: Bill Clinton, Richard Nixon and Andrew Jackson. In the case of Bill Clinton, the grounds on which he was impeached upon was for attempting to tamper with witnesses. These were for making false and misleading statements to the potential grand jury, and encouraging Monica Lewinsky to give a false testimony when she was called to testify—some of the many other charges he faced from Articles I and III of the Constitution. U.S. Code 18 states that a person has committed a federal offense (obstruction of justice) when they corruptly impede or obstruct the administration of the law under which any pending proceedings are being held before any department or agency of the United States. Many are calling Trump to be impeached for obstruction of justice due to the firing of Federal Bureau of Investigation (FBI) Director, James Comey, while he was leading the investigation on General Michael Flynn’s ties to Russia back in May 2017. Flynn had contact with Russian officials and advised Trump on foreign policies during Trump’s campaign trail in 2016. On Dec. 1, 2017, Flynn was pleaded guilty on lying to the FBI about his conversations with Russian ambassadors. Comey also refused to disclose any information to Trump on whether or not he was being investigated, another factor as to why Trump fired him. The firing of Comey because of his investigations on Trump can be charged as an obstruction of justice because Comey’s investigations on President Trump could have uncovered questions about his connections to Russia. This charge would be similar to the charges former president Andrew Johnson faced in 1868 after his removal of the Secretary of War, Edwin Stanton from office. However, like Clinton, Johnson was acquitted by the Senate and was not removed from office. It is unlikely that the impeachment for obstruction of justice will go through, noting that the investigation led by Comey had not uncovered any information as of yet. If Special Counsel Robert Mueller, currently leading the investigation of Trump’s firing of Flynn and Comey, uncovers any information, this could lead to a possible impeachment of Trump for obstruction of justice. To have Trump impeached, the House of Representatives must first create a list of allegations of wrongdoings committed by the president. After that, the House Judiciary Committee (HJC) decides whether the allegations are strong enough to get a full House of Reps vote. If majority of the House vote formal impeachment inquiry, then the HJC determines whether there is enough evidence to warrant articles of impeachment. As of now, there are 239 Republicans, 193 Democrats and 3 vacancies in the 435 seats of the House of Representative. Like the House of Reps, the Senate also has majority Republicans in office. With 51 Republicans to 47 Democrats and two Independents, there is a slim chance that Trump will be facing impeachment because over two-thirds of the votes in Senate are needed to impeach President Trump. Check out our new HS Insider gear!